Let’s say you live in New York City cooperative housing and your apartment could use a new coat of paint. But so too can the hallways, corridors, laundry rooms and stairwells. Who do you turn to? The answer is an interior painting company that goes above and beyond what your superintendent or handyman can do; you need a New York interior painting company like New York’s Concord Painting. It is an entirely different proposition to manage a big project above and beyond your particular abode and it requires an interior painting company that understands the steps involved, the materials and manpower needed. With sixty years of experience and customer satisfaction under its belt, Concord Painting is the company doing interior painting projects for large apartment blocks from Bellmore to Brooklyn. 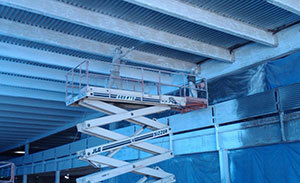 Plus, all Concord Painting jobs keep to an efficient work timetable and come in at cost-effective budgets. For upkeep of common corridors and public spaces that is vital for residential harmony and good landlord/tenant relations, the New York interior painting company of choice is Concord Painting. We at Concord Painting, Inc., make sure that all of our equipment is in good working order as well as make sure our staff is professionally trained and keeping up with Local Law 11. Concord Painting has the ability to handle all aspects of your particular painting job. This means something different for every homeowner. It is important to ask yourself which services you will need from your New York Interior Painting Company.